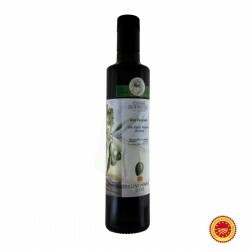 The Extra Virgin Olive Oil of the Company Cosmo di Russo is produced in the south of Lazio, in Gaeta. The goal of the company, born in 2008, is to introduce the Itrana di Gaeta olive all over the world, with the production of olive oil and black and white olives. The Gaeta olives mature in a mild, ventilated climate with the right humidity. Olive trees receive water in a balanced manner throughout the year and grow lush in an area protected from thermal shocks and sudden changes in climate. Cosmo di Russo is the only company producing extra virgin olive oil on the territory of Gaeta and it has won many awards over the years.